A simple act of innocent creativity done completely out of vengeance towards the trash and filth that has been piling up on our streets. And when we hear of it, we wonder why we didn’t come up with an idea as brilliant as this earlier?! 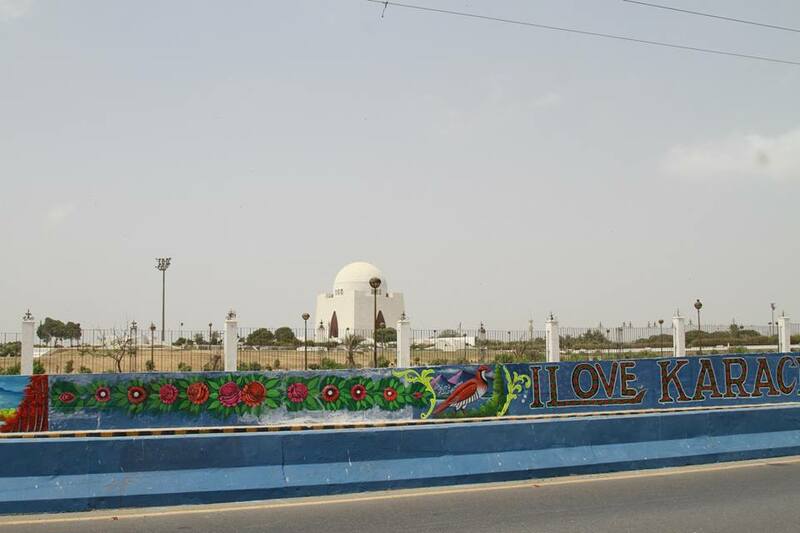 I Am Karachi Group has come up with such an idea, where complete strangers unite to rid their surroundings of unnecessary ugliness through a creative and positive stand. The group uses the time-tested original ‘social media’ i.e. painting on walls. From time immemorial, this medium has been a creative, exciting and anonymity-allowing way for activists of all shapes, sizes, ages and causes to show support for their cause. Color has helped us with major leaps in human evolution, perhaps more than any other tool. Whether cave drawings, symbols, language, colour has been a fast, guttural and fun way to share voices with anyone who steals a look; and there’s something about side-walk messages that makes every passerby want to stop and take a look. There is nothing more raw and visceral than the use of colour to express one’s feeling, thoughts and emotions, even when it could be a repulsion over the hegemony that prevails our sidewalks and pavements, in this case. Until a few weeks ago, Karachi’s walls had been marred by betel spatter, vulgar language and ridiculous adverts of street vendors. This year, a group of people took ownership of this city; their city. 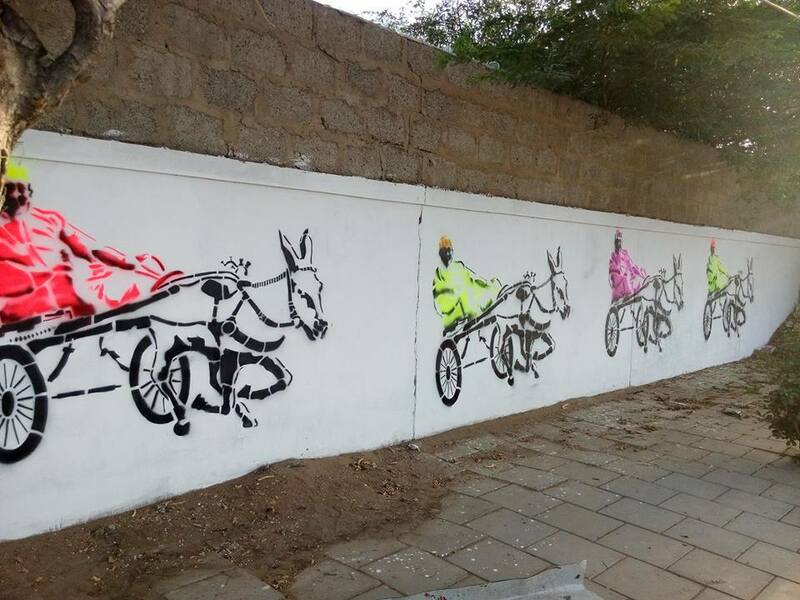 Instead of waiting for a revolutionist or big powerful leader to bring in a whole setup of reforms, these youngsters from various schools and universities decided to take it upon themselves to breathe a new life onto Karachi’s walls. Their idea seems so very simple, yet can have ubiquitous, long-lasting effect on a nation waiting for a change. 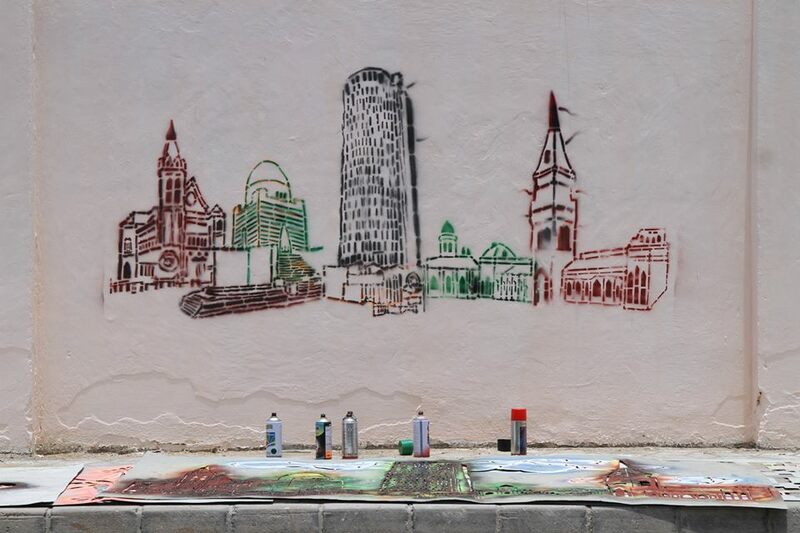 Indeed, Reclaiming The Walls of Karachi, brainchild of a collaboration between Adeela Suleman (head of the Fine Arts Department of Indus Valley School of Art and Architecture) and I am Karachi Group, is a proclamation that enough is enough. To get things moving towards change, whether small steps or big leaps, they have to be taken this very instant. University students and school children have been participating fervently in this project, with a sense of urgency and initiative to take responsibility so high, it is difficult not to get caught up in their infectious vigour. 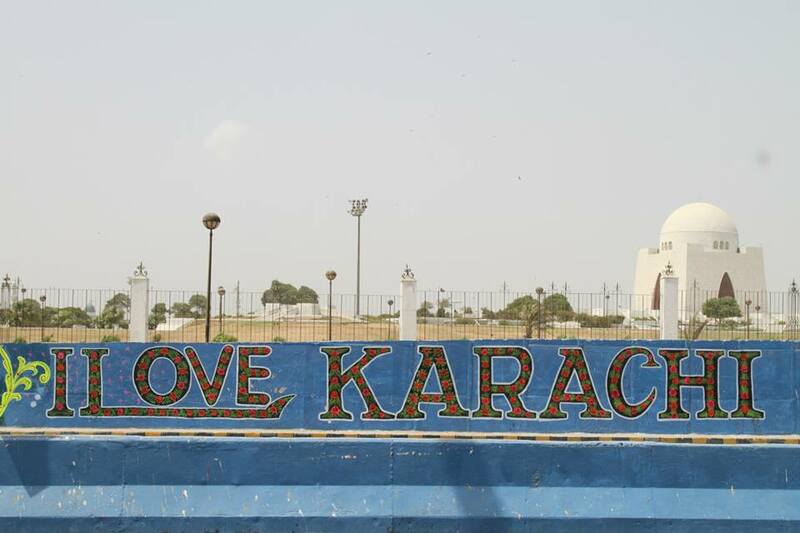 “It’s time we rescued Karachi’s long-standing walls from those who pollute them, and reclaim them back,” said Veera Rustomji, student of Indus Valley of School of Arts and Architecture. 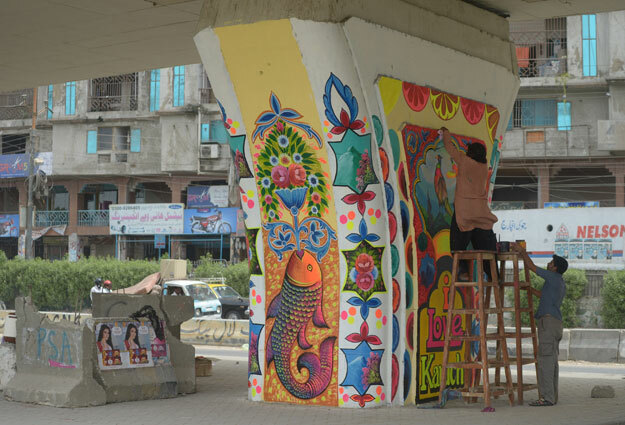 Under the skilful supervision of Munawar Ali Syed, 15 artists have been responsible for the multiple pieces of stencil artwork executed on Hassan Square, Civic Centre, Saddar, Shahrah-e-Quaideen, MT Khan Road, Airport and Kala Pul. 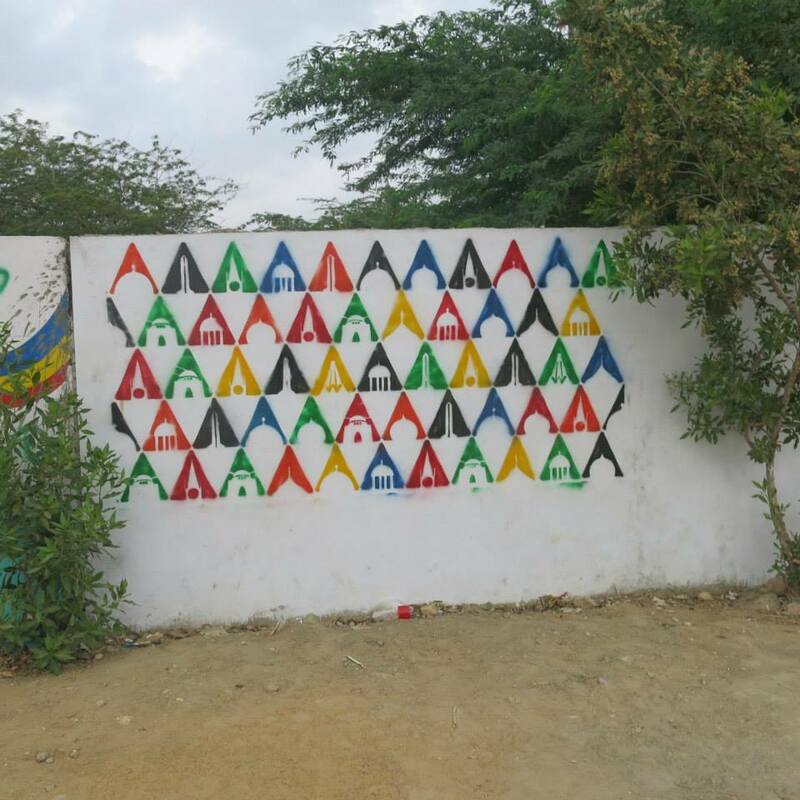 At Shirin Jinnah Colony and Lyari, school children are mapping their school area on the walls. This project, Bachchon Say Tabdeeli, is headed by Rabeya Jalil and Shahana Rajani. 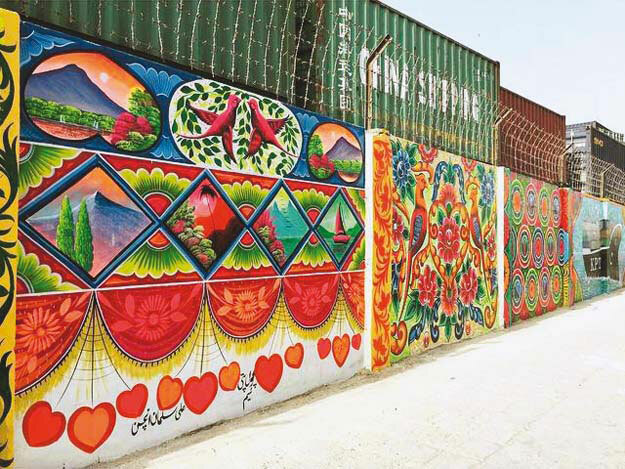 Some of the best artwork can be seen on the walls on MT Khan Road, which has undergone a complete makeover from a dilapidated, unpainted stalemate of shipping containers lined up against the wall to a vast canvas of beautiful truck art, abstracts and local designs. This movement, which has tip-toed itself onto the roads of Karachi will not be restrained here. It will soon spread its wings into other cities and towns, painting them with its vivid imagination, pro-creating a dynamic Pakistan, away from the rubbish and clutter that has piled up on us. This is a movement taken up by the youth of this nation and one can only bask in the energy of it all. Samreen Farooqui holds an MBA from the Institute of Business Administration, with a vast experience in brand management. Currently she is a stay at home mom and a freelance writer, working towards developing a centre for autistic kids in Karachi. Her areas of interest are highlighting the true heroes, books and gastronomy reviews.